(SPOILERS) I’m a little surprised by the BAFTA attention Michael Pearce’s debut feature is receiving, although that may reflect a need to scrape around to find sufficient homegrown films remotely worthy of awards. I think Beast is fine, as far as it goes; it’s well-acted and nicely directed, but it’s also quite unremarkable as a piece of writing, striving but failing to find something new amongst its serial killer trappings. 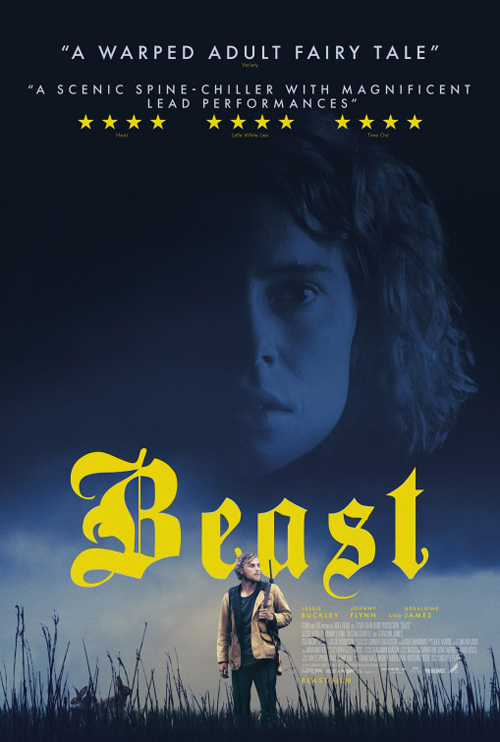 The best you can say of its genre status is that Pearce, who also wrote the screenplay, adopts a low-key, is he-isn’t he for much of the running time, which adopts the point of view of discontented, troubled Moll (Jessie Buckley), more than ready for the attentions of wayward, animal-killing, smelly Pascal (Johnny Flynn) as a distraction from the pressures of an overbearing family (headed by Geraldine James in particularly haughty mode). Pearce’s inspiration was the Beast of Jersey (Edward Paisnel) case in the ‘60s – the director hails from the island, and the French title is the exotic-sounding Jersey Affair – and more specifically “I found out that that he had a wife that never knew about his crimes, and I became really interested in women that were involved with men that are potentially dangerous; what they know, what they don’t know, what they’re hiding from themselves”. Which he explores through Moll, granted her own dark secret that presents a degree of attunement towards her lover. Ultimately though, one can’t help feeling Pearce falls back on something rather less special than he hopes it is – My Summer of Love meets Jagged Edge – complete with false acquittal and subsequent reveal. And, while I said his approach was largely low-key, some nightmare fake-outs aside, he forsakes that in the final sequence for a silly, OTT act where Moll takes matters into her own hands and thus emerges an antagonist herself, with accompanying ambiguity over what this means for her. Buckley and Flynn have undeniable chemistry, and the Jersey-shot footage – Pearce could only afford ten days there due to a combination of the expense and the necessary locations not being there any more, thanks to the ever-encroaching urbanisation, but that’s still ten more than The Guernsey Literary Society and Potato Peel Pie Society managed in Guernsey – lends a remote, isolated flavour to the piece. Pearce is also strong in depicting small community mentalities and the accompanying pressure-cooker claustrophobia they generate, but he’s ultimately unable to overcome his choice of subject matter. Still, he’s definitely made the superior Channel Islands-set movie of the last couple of years, and if he wants to return to loosely-inspired-by events in Jersey for future unsettling projects, he could always centre a film on a certain children’s home.